Bringing its year to a comfortable ending, the MCO finished Sunday afternoon’s offerings with Tchaikovsky’s Serenade for Strings. Nothing wrong with that; it’s a true string orchestra classic with page after page of superb writing for the instruments and graced with an unending flow of surging, full-proportioned melodies. It’s also a score with which William Hennessy and his forces are comfortable, as evident by their bracing assault on the opening declamation, on the right side of aggressive and refreshingly free of hysteria, the temptation to overkill a feature of less emotionally disciplined music-warriors who try to turn each of the composer’s susceptible scores into escapees from Ken Russell’s The Music Lovers. Just the same measured assurance recurred when the initial Andante re-appeared at the first movement’s conclusion. The following Valse also proved to be a model of cutting grace, although the ensemble took its time over some of the pauses, as at bar 33 and later at bar 146. But the movement left a pleasant taste thanks to the warm propositions put by the body’s viola pair near the shapely conclusion, taking over the proposition/response interplay with the first violins at about bar 210. Once again at the Elegie, you could become mildly astonished at how much Tchaikovsky could extract from a simple rising scale with a few hooks at the top; despite the excellent reliability of the violins in soft passages, the main memory I carried off from this reading was the solid underpinning offered by the MCO’s small bottom-lines contingent – two cellos and Emma Sullivan’s double bass – near the conclusion where the three instruments persist with a pedal D in throbbing triplets before breaking off to join with the others for the last high harmonics that bring optimism to an often dark, plangent passage of play. The Serenade‘s finale proved notable for those potent moments where violas and cellos acted in unison, as in the E flat interlude at bar 108 where the violins have pride of place with the segment’s broad theme but the work’s propulsion lies below them, the same effect in the home key at bar 320. Thanks to the director’s pragmatic approach, this movement sustained its tension without descending into the atmosphere of ‘brutal and wretched jollity’, as Hanslick greeted the Viennese premiere of the composer’s violin concerto. 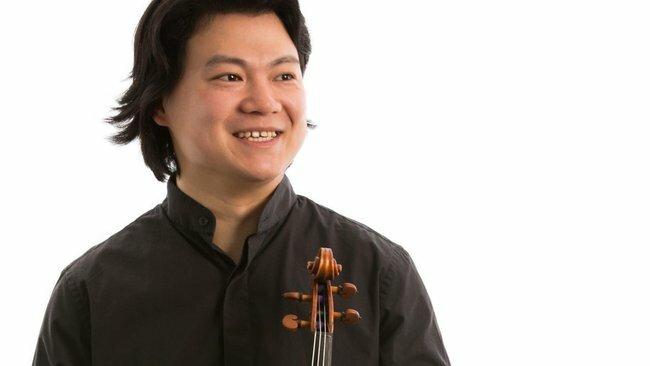 This concert’s other main Tchaikovsky element came with violinist Shane Chen’s firmly considered outline of Souvenir d’un lieu cher, the original piano part orchestrated for strings by Nicholas Buc, who was occupied over the previous three days directing the Melbourne Symphony Orchestra in live-soundtrack versions of the first two Harry Potter films at the Plenary and doing so with admirable expertise. The Souvenir, in three movements, I’ve not heard live before except for the third of its three movements, Melodie, which made a well-thumbed encore at violin recitals some decades ago. Chen’s production is full-bodied and well-framed without being encumbered by superfluous biceps and his line in the opening Meditation made its points with a quiet passion, set up in a warm breadth across the first solo bars where most of the notes lie below the E string. Mind you, Tchaikovsky more than makes up for this sombre opening as the work unfolds with some dazzling pyrotechnics that interpose themselves with brilliant effectiveness, pulling back to a touching sequence of solo violin trills that dominate proceedings about 27 or 28 bars before the end. The work’s central Scherzo gave Chen plenty of scope for rapid staccato/detached bowing, offset by a glowing rendition of the intervening Con molto espressione in A flat; it’s the least inspired group of pages in the whole score but this violinist gave it an appealing Bruch-like breadth that forced you to ignore its structural shortcomings. Hennessy and his colleagues began with Arensky’s Variations on a theme of Tchaikovsky, one of the composer’s better-known pieces and giving fine service to the older composer and the four-square tune adopted for treatment. The MCO made an enjoyable creature of this amiable series of change-ringings, the composer’s inner voices very clear because not smothered by too much violin weight. Not that Arensky does startling things with his tune and reminiscences and shadings come to mind distractingly often, like the Borodinesque Variation VII and the suggestions of Orthodox chant in the score’s coda. Yet the composition’s transparency makes for an agreeable listening experience and this proved to be an honest, well-judged outing for a piece of singular charm. Hennessy filled out his program with arrangements. Rostislav Dubinsky from the original Borodin String Quartet carried out a string quartet arrangement of Tchaikovsky’s Children’s Album and the MCO performed seven of these miniatures, written in readily-admitted homage to Schumann. Little remains in the memory some hours later, particularly as few of the pieces last long enough to do more than make a fleeting impression. The Morning Prayer brings up comparisons with a Mendelssohn Song Without Words rather than implying a Schumann influence; Dubinsky’s sul ponticello scoring in Baba Yaga is a clever touch; Tchaikovsky’s Polka produced from the expert arranger a deft use of harmonics and in its language is startlingly suggestive of the Strauss family; The Organ-Grinder Sings has Dubinsky creating a brilliant squeeze-box imitation which is hard to divine from the original piano score; and the German Song, one of a series of nationalist miniatures in the collection, is almost a satire, occupying a middle ground between a heavy-footed landler and one of Schubert’s slighter fripperies. None of this gave the players much of a challenge except in the interpolated effects and even these were more a question of synchronicity than production. Keith Crellin’s orchestration for strings of the early Three Fantastic Dances by Shostakovich presented more difficult material, not least for the arranger. The opening March is a stop-start affair but the young composer did maintain an underlying pulse which disappears in this revision, as does the buoyancy of the right-hand flights of fancy at the keyboard’s top. The players had more success with the tricky – well, more tricksy, as Gollum would say – Polka with its off-hand cleverness. Cleanly accomplished in the main, you still have to wonder why this triptych – not related in any way to Tchaikovsky, unlike everything else played this afternoon – was included.